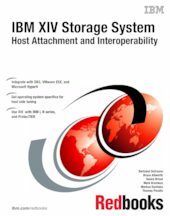 This IBM® Redbooks® publication provides information for attaching the IBM XIV® Storage System to various host operating system platforms, including IBM i. The book provides information and references for combining the XIV Storage System with other storage platforms, host servers, or gateways, including IBM N Series, and IBM ProtecTIER®. It is intended for administrators and architects of enterprise storage systems. The goal is to give an overview of the versatility and compatibility of the XIV Storage System with various platforms and environments. The information that is presented here is not meant as a replacement or substitute for the Host Attachment kit publications. It is meant as a complement and to provide readers with usage guidance and practical illustrations.